For today’s post, I thought I would bring you a little window into my creative mind. Here are some of the things that are really getting my brain going at the moment. This post from Kate Courageous really is causing a revolution inside my skull. Imagine – learning to accept Nigel instead of kicking him? Not practising enough? Susan Piver has some interesting things to say about beating yourself up that are relevant whether you are talking about your meditation or your creative practise. Found this lovely old post by Holly Becker on Decor8 about visual journals. I really like this one about creating a lookbook too. The New York Times on why handwriting matters. Don’t say I didn’t tell you so. The Handmade Home geniuses have their new 2015 planner out! And yes, I am a total planner geek. See also the fact that I have just discovered how Pinterest can feed my addiction! I love iHanna’s blog, but I especially like this post – ‘Glue book where I collect happiness.’ Isn’t that a brilliant idea? Collecting happiness between the pages of a journal. Count me in. This book. 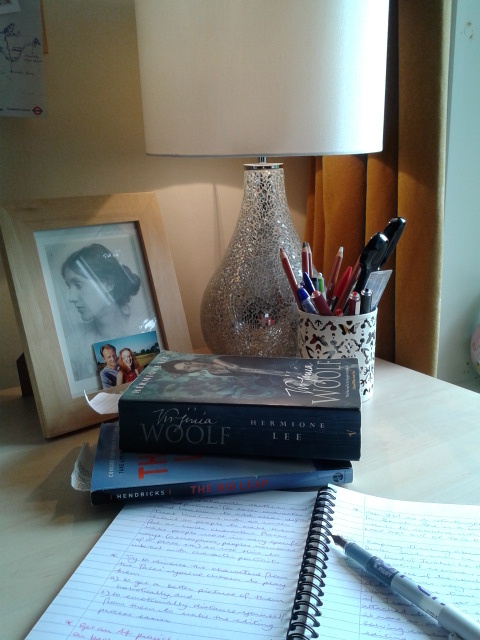 I’ve lost count of how many times I have read this biography of Virginia Woolf, but right now, every time I pick it up, I am filled with a new rush of ideas, inspiration, and fixes for my novel. I’m loving this book as well. This entry was posted in art journaling, core practices, Creativity, Filofax, ideas, Inspiration, Inspiration Monday, Journaling, meditation, My Life, Nigel, Notebooking, On Process, Self Expression, Smorgesbord, The Creative Process, Virginia Woolf, Writing and tagged Creativity, handwriting, Inspiration, journalling, Kate Courageous, lookbook, pinterest, planners, Susan Piver, Virginia Woolf on 23.06.14 by evenlode1967.